My grandparents Elsa and Gustav Spitz were on the 18th Transport from Vienna on 27th April 1942. They were 45 and 52 respectively. I have read a couple of times that the Viennese Jews were amongst the first to be murdered but I have similarly seen accounts which suggest that children and elderly were killed in May. There was then an interregnum until 24th October because the railway line subsided after which the remaining Jews in Wlodawa were killed. I am not sure what the evidence base is for stating that all the Viennese Jews were killed in May (especially if these were mainly women and children) and the selection was based on these criterion rather than their location of origin. I would be very interested if anyone had any information on original source material. I have the sources used by the Yad Vashem book (in the Hebrew version these are all listed) but there is no specific citation of this particular claim and the sources are all very obscure and I have not been successful in finding any to actually read. My best source for the date that the Viennese Jews were transported was my Uncle Phillip. He remembers it very clearly, that the Viennese Jews were the first to go, it was the holiday of Shavuot. There is a complete list of Transport 18 on the Yad Vashem website, that’s where I found his friends’ names. Believe me, I was very surprised to find anything about them at all. 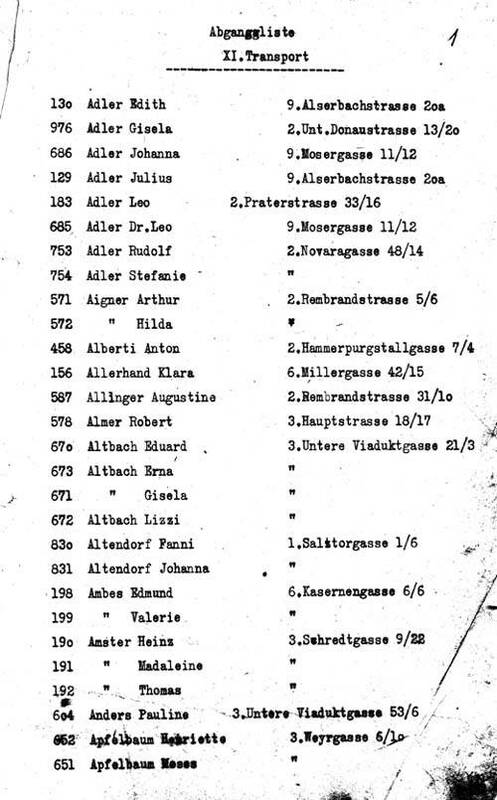 There was a Kinderaktzia on July 24th, where the children were taken away. The following link has been a very helpful site for me, I’ve confirmed a lot of the information with my mother and with my uncle Phillip. Have you seen it? It’s a really fascinating collection of stories about Wlodawa. Good luck in your research–and best wishes for a sweet New Year. Thanks you for getting back so quickly. I have seen the website you refer to. It is amazing how much information is now available and some of it only in the last few years. For many years my family believed my grandparents had been taken to Izbica and I have information from Arolsen suggesting this but I now have facsimiles of the original orders and the account of the rail journey from the commander of the train along with my grandparents’ names on the inventory clearly showing they were taken to Wlodawa. I have visited the town and seen the railway platform where they arrived as well. Is your uncle still alive? I am guessing you live in the States. I am in the UK. A very Happy New Year to you and your family too and well over the fast. Yes, my uncle is alive and well, and is incredibly well-informed about the history of the war and of the area. For years he didn’t want to talk about it, but now he does. You’re right, it’s amazing how much information there is out there. I was stunned when I found that list. Unbelievable, and sad, about your grandparents. I haven’t seen Wlodawa. I hope to visit it, we have amazing family stories that took place there and in nearby Adampol.